When treated alkene with potassium permanganate, two hydroxyl groups are added, so the resulting compounds are called dihydroxylates of the reaction of syn-dihydroxylation. 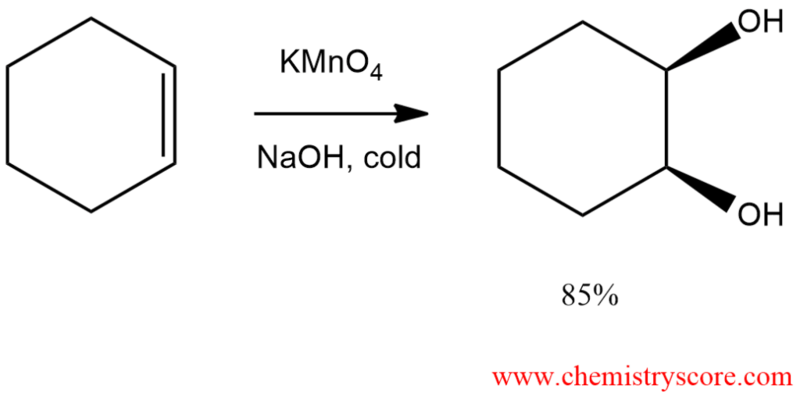 In basic conditions, the diol is formed by treating alkene with cold potassium permanganate. Both oxygen atoms are added at the same time via a double bond. Then hydrogens are added to oxygens and dihydroxylates are obtained. Potassium permanganate solutions, which are deep purple, are used as a color test for alkenes, however: Upon reaction, the purple reagent is immediately converted into the brown precipitate of its reduction product, MnO2. Potassium permanganate is an old reagent for vicinal syn-dihydroxylation of alkanes. It is less useful for synthesizing diols because of a tendency to give poorer yields owing to overoxidation. Nowadays osmium tetroxide is more being used for syn-dihydroxylation. Potassium permanganate is fairly inexpensive; it is a very strong oxidizing agent, and it often causes further oxidation of the diol. Osmium tetroxide, either stoichiometrically or catalytically together with a second oxidizing agent, converts alkenes into syn-1,2-diols.